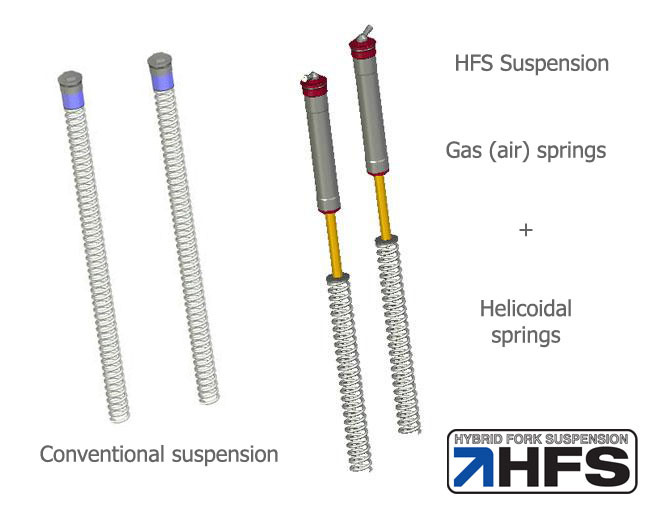 HFS (Hybrid Fork Suspension) is a PROGRESSIVE SUSPENSION SYSTEM for non USD forks, combining action of a gas cartridge (air) and an helicoidal spring. 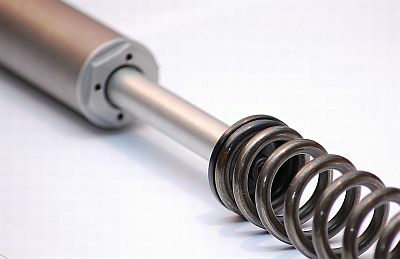 HFS improves motorbike’s original suspension. It is soft at the beginning, being soft at the beginning and reading the track quite well, and it is getting stiffer progressively avoiding suspension bottoming or an excessive dive in braking. 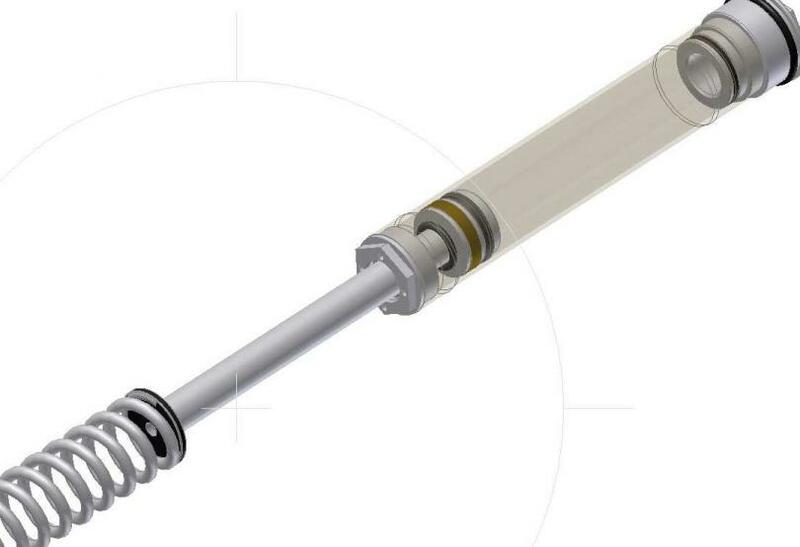 HFS has an influence only in the ‘elastic’ part of suspension: hydraulic damping is not modified. HFS elastic function is achieved with an air cartridge and a spring working in serial. As air has a progressive behaviour, result is a truly progressive suspension that filters terrain quite efficiently and is getting stiffer as fork travel increases. HFS is adjustable. 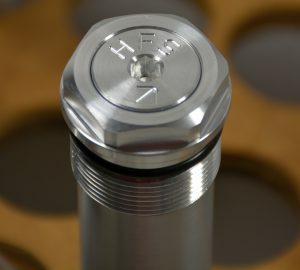 Adjustment is performed through pressure setting in air cartridge. It is done depending on rider’s weight or his riding preferences. Riders with bigger weight will apply more pressure than lighter ones. With this, “static sag” will be optimal for both riders, being able to utilize all suspension travel regardless of his weight, for instance. HFS does not alter the motorbike structurally as it is introduced into the original stanchions. Hydraulic system is not modified. – Adjustable, adapting to rider’s characteristics and riding preferences. – It reads the track in a progressive way. – Higher bottoming resistance in case of severe impacts. – Easy to set up. – It does not have a periodic maintenance. – It does not alter structural desing by motorbike’s OEM. We offer a reliable product, settable, easy to install, providing a remarkable improvement in your motorbike’s performance, without altering manufacturer’s original geometry. It is based in gas non-linear behaviour. 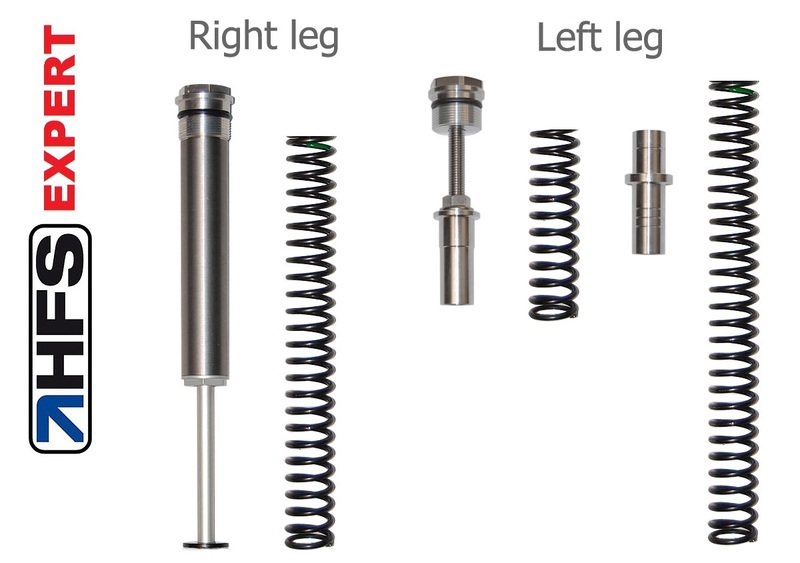 Elastic function of fork suspension is achieved connecting in serial two elements: a gas cartridge and a spring. Gas utilized is air. 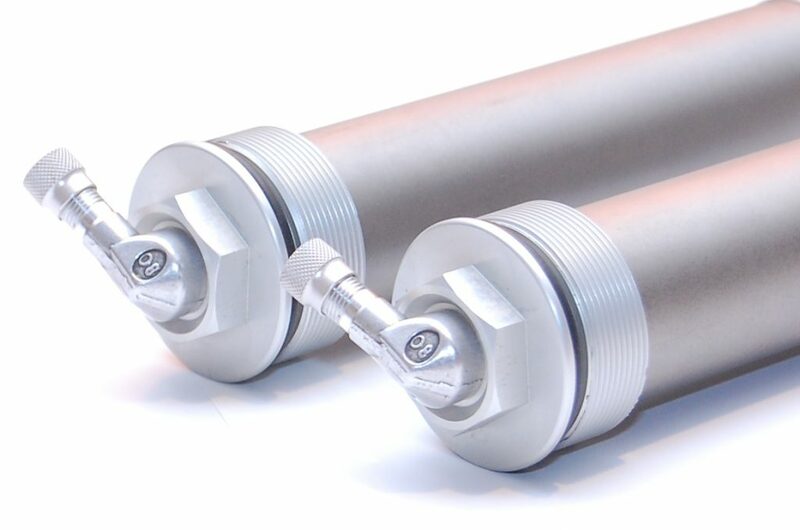 Cartridge’s chamber volume is relatively high, and response is sufficiently stable with temperature changes when riding. – Starting point of red curve shows the initial set-up (pre-load). It is variable depending on cartridge’s set up pressure. – First half of fork travel, approximately, shows a less stiff response of suspension. – From roughly half fork travel, red curve shows a stiffer response. – When it is necessary to absorb a big impact, HFS has a higher limit than original OEM’s. In previous figure it is shown a conventional system and HFS. 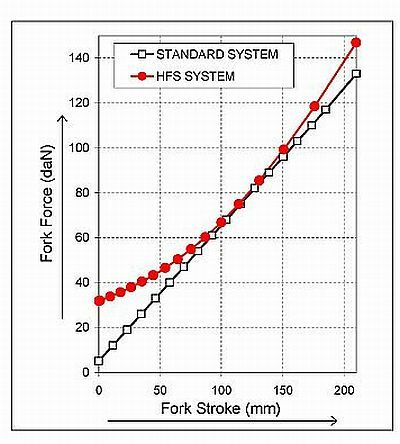 IT is important to remark that HFS system affects only to suspension’s “elastic” part; “Hydraulic” (or damping) part is not modified. 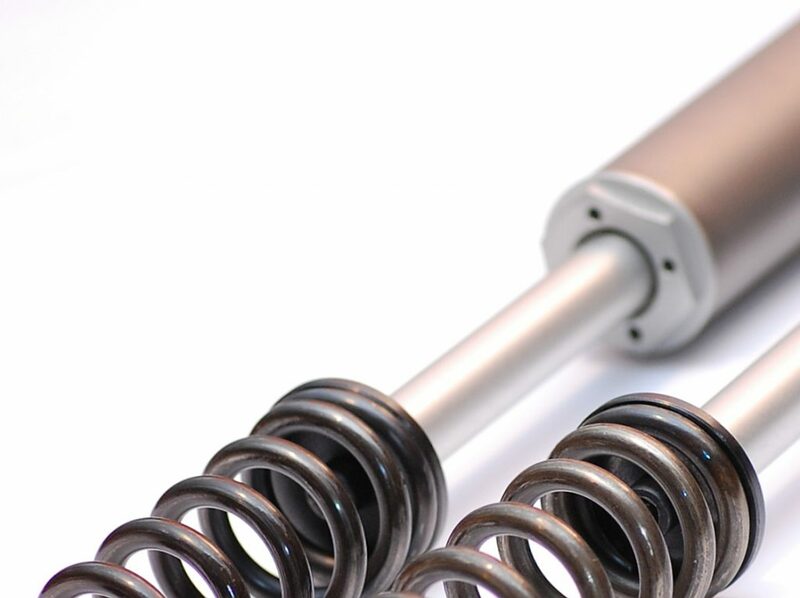 Original components such as upper cap, spacers, spring, are substituted by a special spring and an air cartridge that is pressurized with a manual pump. 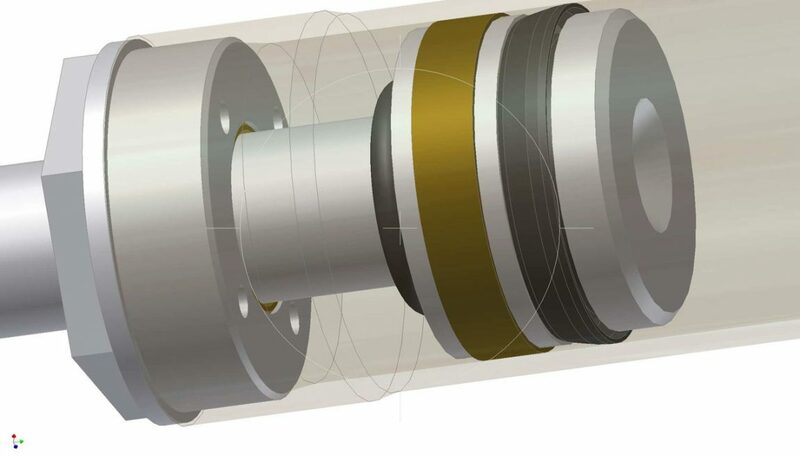 Cartridge is pressurized by a valve installed in stanchion’s upper screw. Pressure set up is done with a manual pump that has a quality pressure gauge. User and Installation Manual has adjustment instructions for each model, depending on rider’s weight. Materials used are high quality and HFS system has two years warranty for manufacturing defects. This design provides quite high performance to from motorbike’s suspension, that is not possible to achieve with conventional solutions. With HFS it is improved performance of both off-road and on-road experiences, with suspension absorbing quite well track imperfections and progressively getting stiffer to have higher bottoming limit with severe utilization (thanks to its working principle and its set up possibilities). In classic motorbikes range (Trial, Motocross and on-road speed racing), valve in upper cap is hidden in order to respect its vintage aspect, and at same time providing a huge improvement in its performance, all in a natural manner. To set up pressure, it is simply a matter of unscrewing the small screw and valve threaded to main upper cap will be accessible. HFS Expert version for Classics Trial motorbikes has in one of both legs a two spring system in which it can be set up the point of higher spring stiffness by simply inserting a spacer in one way or another. You can see details in ‘product’ tab.